When Alfredo Honório happened upon an orphaned otter by a river near his house near his home in Bertioga, Brazil, he knew he had to help. Over the next few months, the retiree played mom to the helpless animal, raising it alongside his black lab puppy. 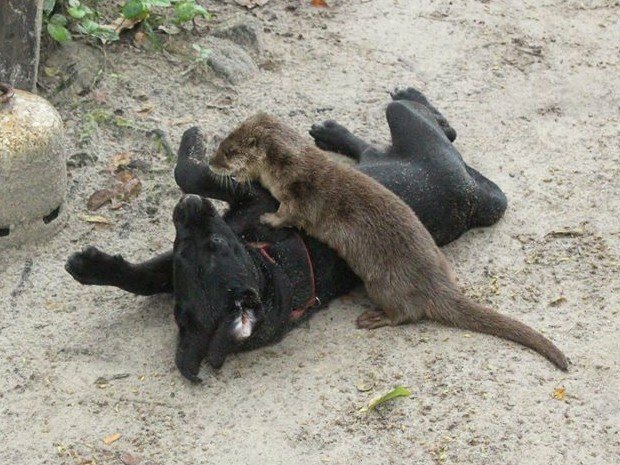 But even after the animal had grown big enough to fend for itself, otter and puppy have remained inseparable friends -- walking, napping, and even swimming together in the nearby river. Their unlikely bond is surprising even to Alfredo, who still has a soft spot for the otter himself, but understands that local wildlife should be cared for, not claimed as a pet. "We are the intruders, nature is theirs. They do what they want." he says. "I am fond of her, but am only babysitting."